Aorta is the largest artery in the human body. It carried oxygenated blood from the heart to the rest of the body. Aortic aneurysm is an abnormal bulging in the aorta. Arteries are usually thick and muscular. They are able to withstand a high amount of pressure. However, due to some causes there is development of a weak area in the arterial wall. This weak area then gives in to the pressure exerted by the blood flowing through it and creates a bulge or balloons out. These areas of ballooning out are called as 'aneurysm'. Aneurysms can occur in any artery in the body but they are mostly common in the aorta. These aneurysms are caused in patients having conditions like hypertension, atherosclerosis (hardening of arteries), congenital abnormality, and people from old age group, habit of smoking etc. Aortic aneurysms do not cause any symptoms at the early stage of the disease. As it worsens, patient may complain of back pain, tearing chest pain, shortness of breath, difficulty in swallowing and cough. If not detected earlier or ignored, the symptoms can worsen leading to rupture of the aneurysm causing the patient to faint, have a stroke or a heart attack. It can also lead to formation of aortic dissection. Aortic dissection is a condition in which there is a small tear in the wall of the aorta. This tear forms a new way for the blood to flow. Because of this flow, the two layers of the wall of the aorta are forced apart. This forcing of the two layers apart is commonly described as â€œtearing chest painâ€. The pain is sudden in onset and very severe. Aortic dissection is a medical emergency. If not attained as soon as possible, it can lead to rupture of aorta, heart failure and sometimes even instant death. Aortic dissection mainly happens in people having hypertension, connective tissue diseases, congenital diseases and people having aortic aneurysms. These both conditions are life threatening if left untreated or ignored. These conditions are diagnosed by tests like USG, chest X ray, 2D echo, CT scan and MRI. To diagnose aortic dissection D dimer is the confirmatory test. These conditions can be managed in two ways. The medical therapy requires very strict control of blood pressure. Blood pressure is controlled by medications and lifestyle modifications. In spite of medical treatments, it is always better to get treated with surgical methods when it comes to these two diseases. In emergency situations like sever aortic dissection surgical treatment is the method of the choice. The surgical treatments are of two types namely open surgical repair and endovascular repair also known as aortic stenting. In open surgical repair, the surgery takes place under general anesthesia. The surgeon makes a larger cut in the chest or abdomen according to the location of the aneurysm. Then the area affected by aneurysm is separated from the rest of the organs. A synthetic tube is inserted in the aorta in the place of the aneurysm. This surgery takes long hours to complete and the patient will then have to be kept under observation for 7 to 10 days in the hospital. 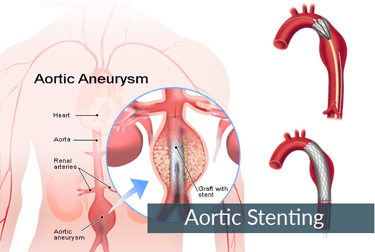 Endovascular repair (aortic stenting) is a less invasive alternate option to do the repair of aortic aneurysm by using an endovascular graft or stent. This procedure can also be done under local anesthesia. In this procedure, instead of a long incision, only two small incisions are taken in the groin to introduce a thin tubal catheter in the large blood vessels in the groin. The catheter is then guided to the location of the aneurysm in the body under the guidance of X ray. Then the operating endovascular surgeon lowly introduces the aortic stent in the aneurysm. As it is released, it expands to a size that fits in the aorta above and below the aneurysm. After words, the delivery catheter is taken out by leaving the aortic stent behind. Additional stents may be placed according to the size and shape of the aneurysm. It takes almost 2-4 hours to complete. This procedure is minimally invasive, it also takes less time. Lesser area is exposed during the procedure hence the chances of post procedural infections are very less as compared to open surgical repair.